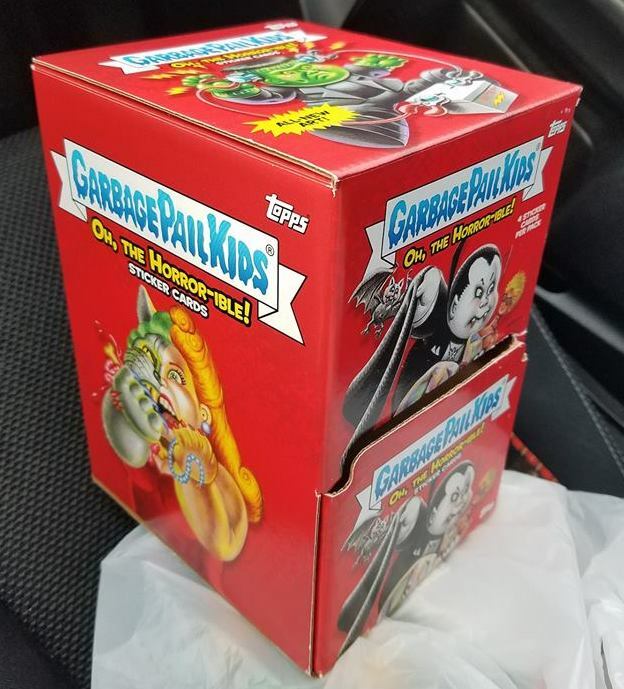 Thank to GPK collector Luke Parks for being the first to post images and let the community know that Dollar Store packs/boxes are now out for 2018 Series 2 Garbage Pail Kids Oh the Horror-ible. These no-frills packs are a tradition every release. These are only made for Dollar Tree stores. Each pack comes with 4 base cards, with a SRP of $1.00. There are no “hits” in these packs, no parallels, no inserts, etc. Collectors buying these like having an unopened pack/wrapper for their collection. The boxes are also sought after for collectors wanting empty boxes. They resemble the old gravity feed boxes, just a little smaller. 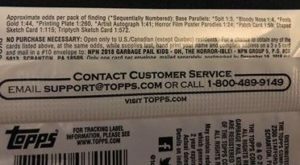 Collectors were not sure if Topps was going to continue to produce the Dollar Store packs, since the Target Gravity Feed boxes were cancelled beginning with this release. However, it appears the tradition will continue. Be sure to hit up your local Dollar Tree for some base card love. The rest of the checklist is pretty much as expected. Bathroom Buddies, which will appear in both types of blaster boxes has 6 cards on the checklist. The Jumbo Bonus Classic Monster stickers is 20 cards again. While the “bonus” Horror Film Poster Parodies cards found one per Collector box, once again is at 10 in the set. The patch cards found in Collector boxes remains at 20 cards, and just like We Hate the 80’s appears to use the same cards as the Classic 80’s sticker Jumbo Insert Set. The Trick or Treats insert set originally set for Gravity Feed boxes also appears on the checklist. This 10 card set might be appearing in regular retail boxes. For the first time Topps has listed both the final card artists and sketch artists on the checklist. Eight artists completed finals for the set; Brent Engstrom, David Gross, Joe Simko, JungHwa Im, Layron DeJarnette, Maran Kim, Neil Camera, and Smokin Joe McWilliams. 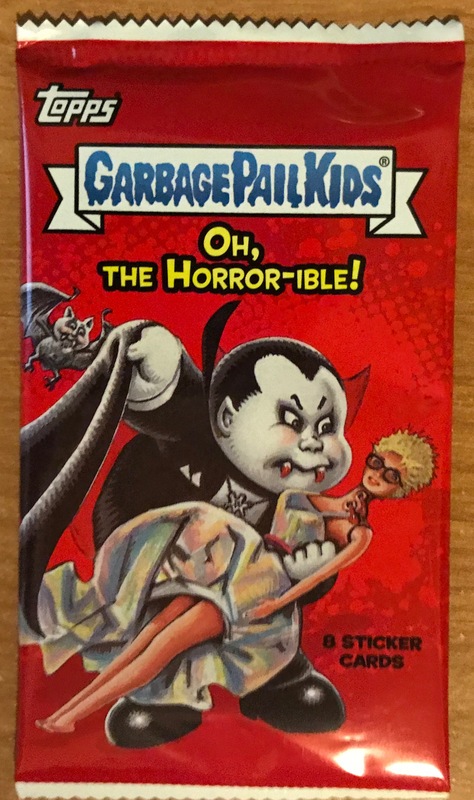 The complete checklist for 2018S2 GPK Oh the Horror-ible can be found here in PDF version. Sketch artists have been done with their sketches for the upcoming 2018 Series 2 Garbage Pail Kids Oh the Horror-ible set for a while now. Topps has reviewed them and made their approvals. So why haven’t we seen sketch previews pop up? With the change in leadership in recent weeks over GPK at Topps, the rules have changed slightly. When artists received their approvals, they were instructed not to show their sketches until release date. This is a very short sighted approach from Topps. Topps is missing out on free publicity for the upcoming set. The past has shown that GPK collectors enjoy seeing what they have a chance to pull, and the previews influence their buying decision. It also allows artists to show off their work, and promote commission sales. Despite this decision, a few artists have posted a handful of previews for the upcoming set. A record high 58 artists have completed sketches for the upcoming set. Below is a few of the examples that have been shown so far. (Note that all sketches must be approved by Topps before being inserted into packs. Also, Topps will hold sketches back for replacements.) All photos courtesy of the artist, their Facebook page and/or website. 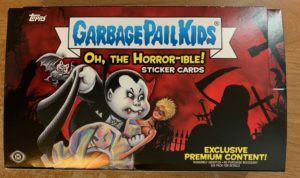 2018S2 GPK Oh the Horror-ible will hit stores on 9/19/18. 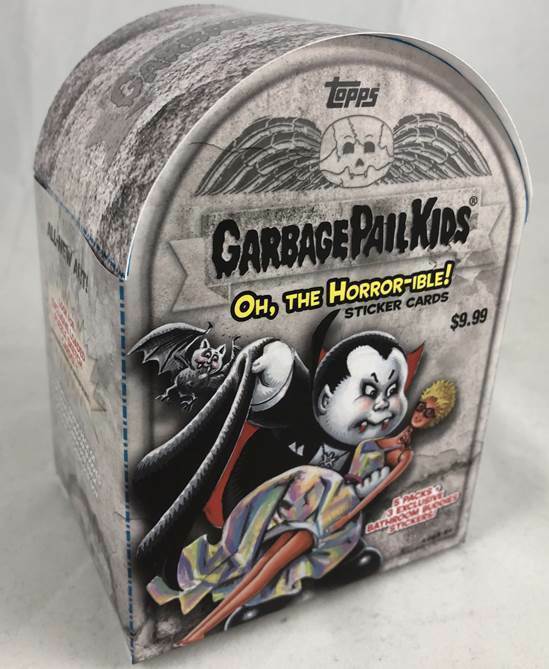 Just last week Topps was showing off the Value Box for the next retail set, 2018 Series 2 Garbage Pail Kids Oh the Horror-ible. 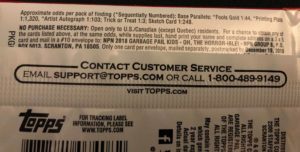 Today Topps is making more changes to the retail lineup as they alerted distributors that the Gravity Feed configuration of the product has been cancelled. Lack of orders for the Gravity feeds was cited as the reason for the cancellation. 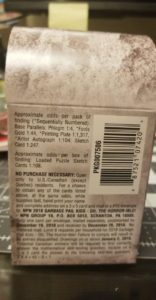 Regular retail boxes, Value Fat Packs, and Blaster boxes are still scheduled to be released to retail stores. In the past Gravity Feed packs were found primarily at Target. These 36 pack boxes contained the exclusive Yellow Phlegm/Pee parallels the past few releases. 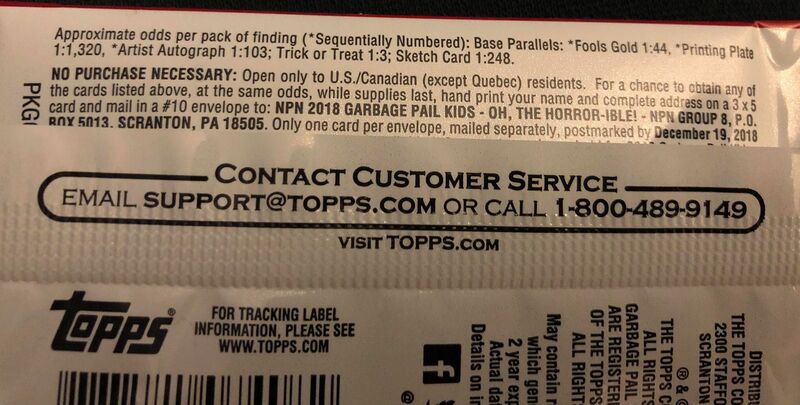 Topps told distributors that the exclusives found in Gravity Feed packs would be moved to the regular Retail Display boxes. 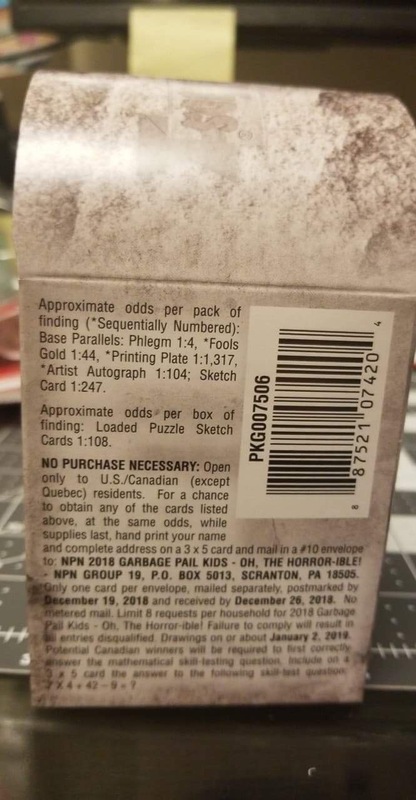 According to the sell sheets the two exclusives for this release for Gravity packs are the Phlegm parallels and a new Trick or Treats insert set. 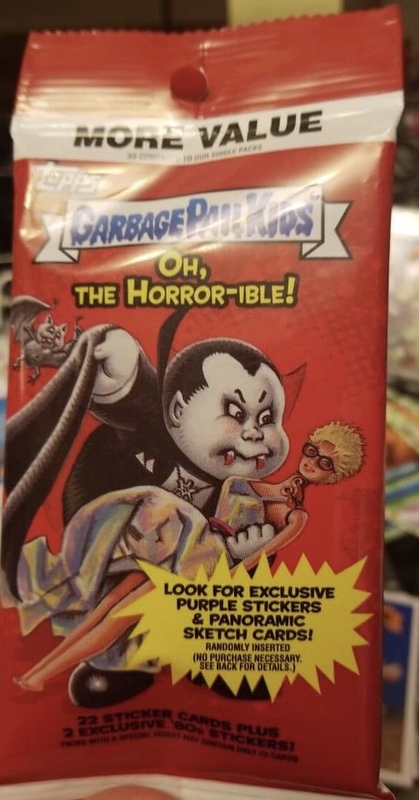 2018S2 GPK Oh the Horror-ible is set to release on Sept. 19, 2018. Topps shared with retail distributors today a preview image of the Vlaue Box (Blaster) for 2018 Series 2 Garbage Pail Kids Oh the Horror-ible. 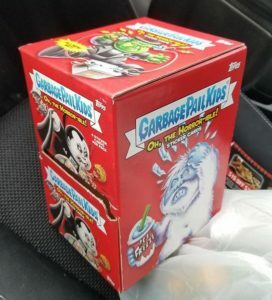 The box features an image of Nasty Nick on the front with the shape and art details on the box made to look like a crypt. The box design will be the same on both the EA and SE versions of the box. Topps also notes that it has extended the order date for distributors until June 11th. 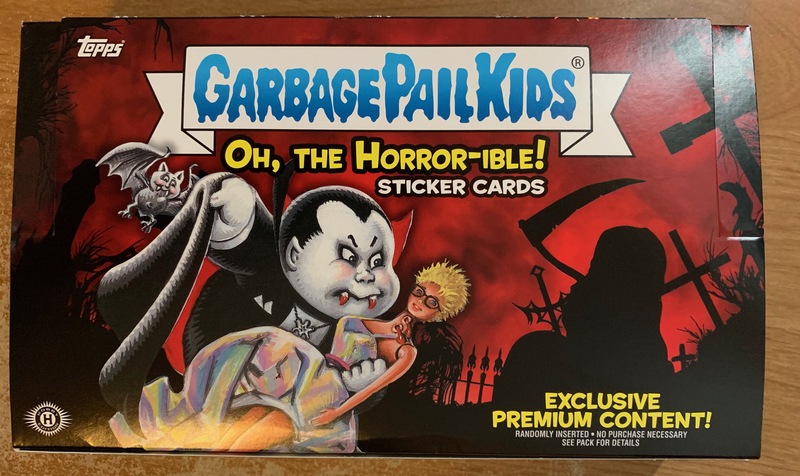 2018S2 GPK Oh the Horror-ible is set to release on Sept. 19, 2018.